Our biodegradable translucent business cards use a plastic that allows light to pass through diffusely. This unique property allows for truly unique design elements such as watermarks or dual plane printing. The cards are printed by hand, one at a time, using traditional artisan methods. We have a broad range of beautiful metallic and pigment inks, ensuring your business card will stun prospective customers. Our tinted translucent plastic cards are created by chemically laminating a plastic colour gel with a layer of translucent polymer. The surface of the card has a matte texture helping to beautifully diffuse light as it passes through. One by one, our artisan hot foil printers apply each metallic or pigment ink to the cards surface using traditional methods. Our satin plastic cards get their name from the refined matt texture of their surface. Produced using solid core polymer plastic, the unique nature of the materials surface empowers the designer to create contrasts of texture by applying glossy varnish to selected areas. We add the beautiful metallic inks by hand, one by one, using traditional artisan techniques. Our full colour plastic cards are durable. We encapsulate the digitally printed artwork between two thick sheets of crystal clear PVC. This protects the card against wear and tear and allows us to offer a choice of a glossy or matt surface as well as three different thicknesses. The artwork is printed in full colour on both sides and, should it be required, we can personalise the cards with signature strips, numbering or even individual names. Our wooden business cards are available in Finnish birch, bamboo, American cherry and black walnut. Each has been carefully chosen for its distinct coloration and characteristics. 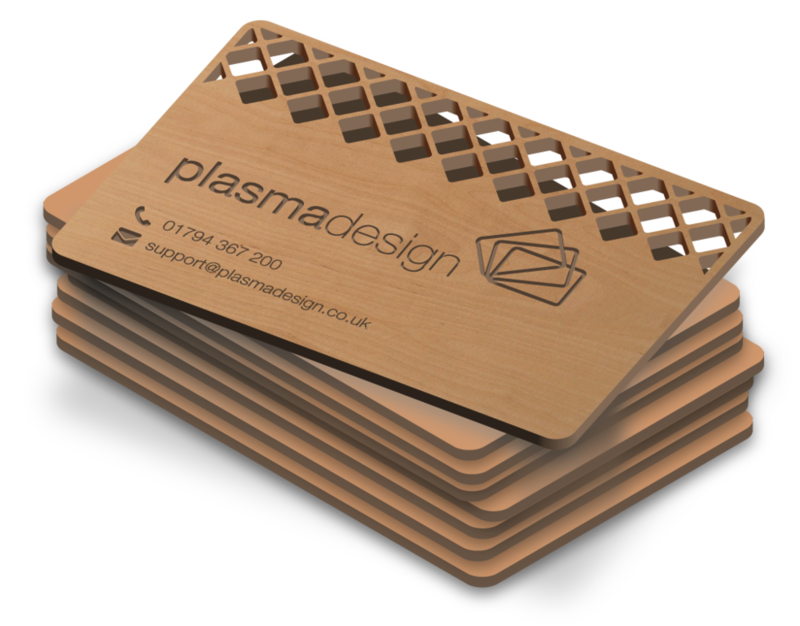 Each of our wooden business cards is carved using state of the art CO2 laser-milling machines. We then laser engrave the text and artwork into the surface of the card at an astonishing resolution of 900dpi. Not only can we cut through the wooden business card, we can also alter the shape of the card itself by cutting away wood from the perimeter. And as long as the desired shape fits within the dimensions of a standard card, there is no additional charge. 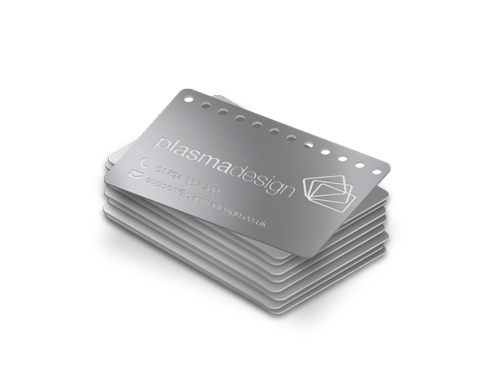 Available in three thicknesses, our original metal business cards are carved from marine grade, rolled stainless steel. Our state of the art production capabilities allows us to cut through the steel with incredible precision and to etch the metal surface with bespoke fonts and graphics. We can even alter the shape of the cards perimeter. Etched text contrasts with the unetched fine grained steel surface, ensuring legibility. Produced using the same materials and production processes as their bigger brother, our mini metal cards are a quirky and more cost effective solution for people who want to make a lasting impression. We can cut through the steel with extreme accuracy and etch into the cards surface with precision and finesse. Want a mini metal card with an unorthodox shape? No problem. We can do that too. Available in a your choice of traditional yellow or rose hues, our gold metal cards are manufactured by cutting and etching the design on to polished bronze. We then apply an oleophobic, transparent lacquer, protecting the bronze from natural tarnishing and reducing its tendency to attract fingerprints. The result is a gold coloured card that retains the spectacular visual properties of the metal without suffering the drawbacks usually associated with bronze. 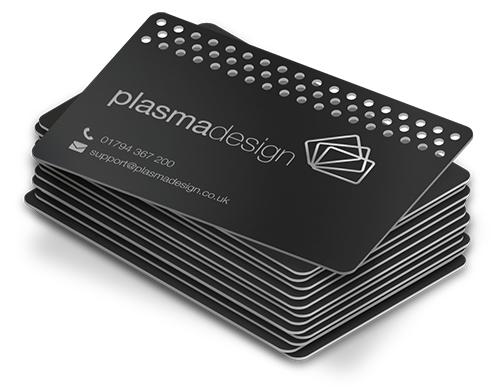 Produced using rigid 400 micron marine grade stainless steel, our exclusive matt black metal business cards are truly exquisite. Using our photochemical production process, we cut through the steel and laser etch into the tough, anodised matt black surface to bring your design to life. Printed by hand using traditional artisan techniques, there’s no automation and no compromise, just good old fashioned hard work. Each ink is gently embedded into the subtly textured surface. A seam of colour runs through the centre of the triple ply card, adding a unique finishing touch. 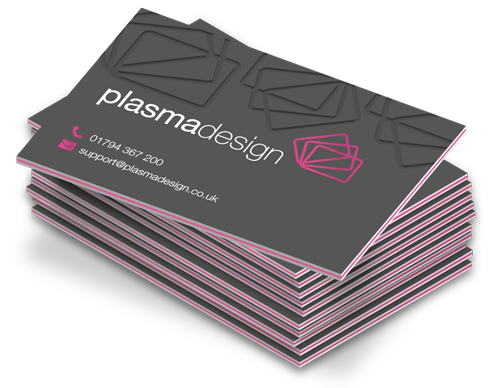 Our standard cards are manufactured using thick 400gsm ultra white stock and printed in full colour on both sides. Colours are vibrant; text is crisp. Matt lamination protects the surface. 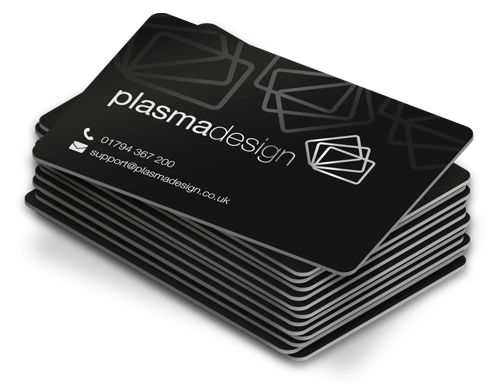 As with our plastic and metal cards, we provide a free design service to all customers who do not already have artwork.